Producing your first TV commercial may seem like a daunting task. While many people think about the creative aspects involved, there are a lot of organizational and project-management aspects that go into a shoot as well. Following these 10 steps can help prepare you for a successful commercial shoot. Once you and your company/client have decided that you need a new commercial, there are many steps that make up the creative process. However, that isn’t what we are going to cover here. Instead, we’re going to focus on what happens after you have an approved concept. Whether you’re the account manager, art director, or simply the person charged with the task of getting a commercial created for your client or business, there are a lot of moving pieces from a project-management standpoint to be aware of to ensure your success. What are the run dates? Will this be video, a series of photos, or a combo of both? What are your location requirements? What other mediums will the final product be used for? Are there target shoot dates? Gathering this information early in the process is key, as all these items will affect what you do moving forward. You’ll need to know this information like the back of your hand when it comes to coordinating with other vendors for the project. Let’s look at each in more detail. If you’re working with a production house, they’ll likely bundle a lot of things together, like videography, editing, equipment rental and craft services. They can also offer guidance for allocating the budget based on the creative concept to make sure that you can fulfill the vision. Run dates come into play when dealing with talent and determining usage fees for the length of the campaign. It’s important to note that if you’re shooting a commercial in summer for the holidays, you may need to do extra work to ensure it looks like the holiday season and not the middle of July. Additionally, your run date gives you a timeline for the completed project. Typically, you want to supply a final, approved spot 3–5 business days before it’s supposed to air. You’ll need to allow time for shooting, editing, sound mixing, and approvals from the client. Will this be video or a series of photos? If you’re shooting a commercial, you’re most likely going to need to shoot video. There are instances where only photos are needed, but for the sake of this discussion, we’re going to talk primarily about video. Your creative team will tell you what they need based on the commercial’s concept, but it’s an important question to ask. What video quality will you need i.e. 33 mm or HD? That will affect things like equipment rental so it’s important to know upfront. Your director will be able to help you answer this too. What are your location requirements? Is your commercial set outdoors at a park? Is it set inside a retail store? Is it a concept that requires a green screen? What about a custom set? Think about venues that could serve as multiple locations. You want to make sure that you’ll have a place void of loud noise or other interruptions if need be, as well as plenty of space for the crew, props, and wardrobe. You can also hire a professional location scout who will be well versed in all aspects of production and location quirks, for instance, where the sun rises and sets at a given location but this is an additional expense from your budget. To cover your bases, it’s important to find short-term location insurance. It will cover items such as general liability, third-party property damage, owned and rented equipment, workers’ compensation, plus non-owned and hired auto. What mediums will the final product be used for? Will you be using this commercial for television only, or will it also be re-purposed for the Internet? The answer to this question will affect your contract with any talent being used in the commercial. It’ll also help you determine whether you need multiple cuts with different call to actions based on the medium (e.g., “log on to” versus “click here” to drive viewers to a website). Is there text that needs to be added to the commercial post-production? Do you need a green screen for post-effects work? Is there a voiceover needed? These questions will all need to be answered early on so you can plan accordingly. Apart from the run dates, are there specific dates that are being targeted for shooting based on location, talent, time of year, etc.? How many days do you estimate you’ll need to shoot? The number of locations/shots will help you to determine this. Now that you have all this information, it’s time to move onto step 2 and start finding your crew/vendors. If you don’t have an in-house video production crew, you’ll most likely be looking for a local production house for your videographer/director/editor. Every major city will have several options for you to choose from. Talk with co-workers, peers in your industry or just do a Google search. Look at their websites and see if you like their work. Vetting directors is important because each has their own style. Review all the quotes that come in, being sure to ask questions if you don’t understand something; feel free to negotiate. While it’s unlikely they’ll cut their budget in half, there are often ways they can cut costs to bring the price down. Once you’ve selected your production company, you need to look for any crew members that they won’t be providing. This isn’t usually the first item people think of, but it’s a key component to helping you achieve the creative vision. Often times, you can find someone who will do both hair and make-up. Even if the production company is not supplying this, they may have some names for you of professionals they have worked with in the past. If your budget is tight, you can even request the talent do their own hair. Hiring students studying esthetics or cosmetology to do make-up is another great way to cut costs. If the goal of your commercial is to sell clothing, you should work with the client or in-house team to pull items from the store for the actors to wear. You can also hire a wardrobe consultant to select appropriate items and style actors at the shoot if needed. If wardrobe is less important, you can shop on your own or provide your talent with direction on what to wear. Depending on the length of your shoot, you may need to hire a caterer/craft services company for the day of the shoot. Shoot days can be long, so it’s important that everyone have access to food and beverage. You can hire a company to do this for you; you can have the production company take care of everything; or, you can provide it yourself. If you’re going to provide everything yourself, there are more details for you down in step 10. Based on the storyboard, you and your creative team should be able to pull together a list of actors needed for your shoot. No matter how big or small the role may be, you’ll need to have a list of everyone that needs to appear on camera. This includes extras. Sometimes your talent will need to perform certain acts during the shoot. It’s important to make these known ahead of time so they can be prepared if they need to lift heavy items or perform a certain physical activity. For example, below is what we used for our client, Shoppers Supply, during their commercial shoot. MALE (age 35–60) – cowboy type, will need to be able to lift 20 lbs. MALE (age 30–50) – father and outdoors man, comfortable holding a gun, will need to be able to lift 20 lbs. MALE (10-16) – son, will need to be able to lift 5-10 lbs. This list gives everyone on the team a general idea of who is needed, as well as what types of things they might be required to do during the shoot. If you’re hiring professional actors, you’ll need to work with a talent agency. Send them the casting breakdown, tentative shoot dates, storyboard, script, length of campaign, and mediums. They’ll then either send you headshots or give you access to an online database to search yourself. Let the agent know who you’re interested in seeing for an audition and your available dates/times. With a tighter budget, you might find yourself using friends and family for talent. While this can be tempting as it saves money, I recommend cutting costs elsewhere and hiring professionals for any speaking and/or major parts. To see if your actors are right for the part, it’s typical to hold auditions. You can have them come to your office, the client’s office, or casting agent’s office. You can instruct them to dress a certain way so that they fit the role you have in mind. It’s best to include the copywriter, art director, and director during the auditions so everyone is on the same page. If there are lines, have them read the lines for the camera. If there are no lines, you can have them perform a similar act to what the script requires. I would recommend that you either photograph or take video of each actor so you can review it later. Once auditions are complete, review your photos or tapes and make your final decision. Let all the agents know if it’s a yes or no. They’ll take care of informing the actors. If you’re using an agent, they’ll take care of the talent releases, but if you’re using your own talent, you’ll need to get them to sign a release to use their image/likeness/voice. You can find some standard language for this on the Internet, but it’s best to cover your bases by including multiple mediums in the release (i.e. more than just video) in case you want to use stills in a brochure, or behind the scenes photos on social media. Keep in mind this may affect talent costs. Have talent sign the releases, and keep them on file. When it comes time to find a location (or locations) to shoot at, start by getting a description and/or list of requirements from the director (or pull it from the script/storyboard yourself). This will ensure you don’t miss anything. Always keep your location(s) budget in mind. Using your own network of personal and professional contacts to find some options that fit your requirements is a great way to keep costs down if your budget is tight. Sometimes one location can fulfill more than one shot so if you need options, try to find one site to fit as many as you can. For our Donor Network of Arizona commercial, we needed a location that included a bedroom, living room, backyard-wedding venue, and a hospital. We were able to find one space that met three of the four criteria, so that allowed us to cut costs by only having to find one more location, rather than paying for three unique spots. The Internet can be your best friend when location hunting. Many exteriors, as well as some interiors, can be found with Google Earth and venue websites. It’s best to visit any locations you’re considering in person before committing to one. Most likely the director will want to accompany you. Will you have the location to yourself for filming or will part of it be open to the public? Is there ample parking for you, the crew, and catering truck if needed? Is there room to fit any needed equipment? Will lighting be an issue? Are there any limitations to what you can do while there? These are all great questions to think about during your review process. They’ll help you decide the best option for your shoot. Take pictures when scouting as they’ll come in handy while planning the shoot. No matter what your commercial is for, your talent is going to need the appropriate attire and props. I recommend compiling a list of everything you’ll need. To do so, go through your script, scene by scene, and document any necessary wardrobe and props needed. Be sure to include who they’re for. If you’re having talent provide their own wardrobe, give them a write-up explaining exactly what you’re looking for. It’s best to have them bring a few options to the shoot, as well as have them provide you with photos in advance so you can approve everything. It’s best to also provide some general guidelines on clothing fit, hemlines, etc. Are you shooting a mom helping a child with his homework? While the location will most likely provide the furniture, you’ll need to have things like a school book, notebook, pencil, and maybe a backpack slung on the chair. Create a prop list by scene and then by actor. Asking people in your network is always a good start, but stores like Goodwill and Wal-Mart can be great places to pick up small items without denting your budget. Now that you have your team, location, and talent, it’s time to get the whole team together for planning. Sit down with the director, art director, photographer, copywriter and anyone else involved to start with mapping out your shooting schedule. As a group, put together a list of all the shots that are needed, with specific requirements for each. Commercials aren’t shot in chronological order, but rather in order of efficiency. Additionally, each shot will take time to set up so your schedule should include time at the beginning of each shot for set-up and time after each shot for tear down. Talk with the production company or director to estimate how much time your crew needs before and after each shot. With the allotted preparation time, and additional break time for meals, your schedule should start to take shape. A good production company should provide this timeline for you. Below is an example from a commercial shoot we did that included three shots within the same location. Pre-production meetings are also the time to talk about any required equipment rentals, like dollies, backdrops, boom mics, etc. Most film crews have some equipment but will often rent specialty equipment just for the day. They can usually take care of the rentals but it may affect your budget, so it’s good to know what those costs will be in advance. If you’re working with a full production company, they may include all these items in their initial estimates. In addition to production equipment, think about renting items like tables for craft services and props, as well as racks for wardrobe. If you’re doing craft services yourself, it’s also best to have a few coolers to keep beverages and any perishable food cool, especially if you’re shooting outdoors. Make reservations for all equipment rentals and arrange for someone to pick up and return them. If you’re filming in town, then you may not need to worry about travel arrangements, but if there is travel involved, you’ll need to think about flights, hotel rooms and car rentals. Once booked, make sure every person has a copy of their itinerary, confirmation numbers and any tickets they’ll need. Even if filming in town, you may need parking permits. If not, it’s still a good idea to determine the best parking areas for everyone based on their call time. To keep yourself and the group organized, you’ll need to prep some materials in advance and share them with the cast and crew. The call sheet will contain the contact information for everyone involved in the shoot, including details such as their role and cell numbers for everyone involved. You’ll also need to include call times for everyone. Crew may need to show up at 7:00 am, but talent that’s only in one afternoon shot may not need to be there until 1:00 pm. When assigning call times to talent, make sure that you’re including time for them to get ready. In other words, the call time is not when they’re needed for their scene(s), but rather when they’re needed to be on set to start getting ready. The call sheet should also include information about the location and parking details. 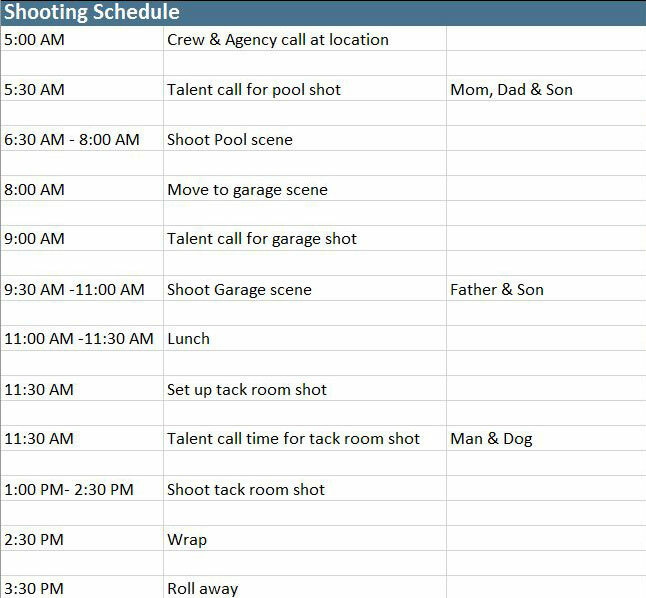 Include a copy of the shoot schedule for the day. To keep everyone on track, have copies of the script and any storyboards created. Package these items together and send off to each person. Don’t forget one for yourself. Finally, it’s the day of the shoot. If you’re on a tight budget, you may find yourself wearing many hats. You’ll be busy and being asked lots of questions, so the more prep work you do ahead of time, the better off you’ll be. First things first. When you get to the location, set up your table for props. First, you will want to section off an area for each scene and label everything by actor. Then, anything that’s not wardrobe or part of the set dressing is considered a prop. If you have multiple outfits for talent in different scenes, hang/sort all your outfits by actor, then by scene. This will allow for quick wardrobe changes. Set up a table (away from wardrobe to avoid spills) with all your food and drinks. If you’ve hired a craft service company, simply show them where they can set up. One last item to keep in mind is the overall timeline for the day(s). Do what you can to keep production moving forward and on schedule. While it may seem impossible to stick to the schedule, you want to stay as close as you can, especially if you only have your location for a limited amount of time. While too many people can overwhelm and clutter a space, having an extra set of hands the day of to help with miscellaneous tasks, like helping actors get into costume, handing them their props or keeping the food and beverage table tidy, can come in handy.